Do you want to contact Facebook support (or admin / owner)? Everytime Facebook introduce a new feature or functionality, Facebook users want to contact Facebook support for the feedback. Urge to contact Facebook support is more when a new feature is not liked by users at large. Facebook is a big concern and contacting them directly is not easy. Most easy way to contact Facebook is by using contact forms for specific Facebook features. Make sure you describe problem in detail with proper screenshot images for an active reply. 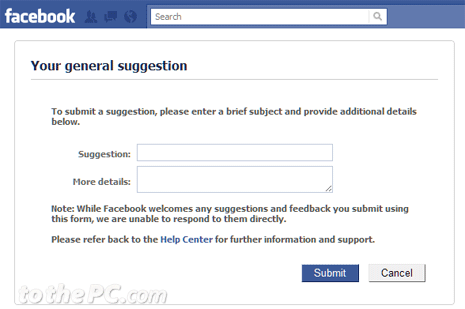 If you only want to send general feedback to Facebook, then use General Suggestions form for submitting your feedback. To submit a suggestion, enter a brief subject and provide additional details. Facebook will go through your feedback or suggestions but may not contact you directly for reply to your submitted feedback. If you want to contact Facebook in regard to specific feature or functionality – then use appropriate contact form for the same. Contact Facebook for specific features like: Comments and Likes, Home page and News Feed, Notifications and Emails, Pages, Profile, Search, Credits and Advertising. Contact Facebook for applications like: Chat, Events, Groups, Messages, Links, Notes, Photos, Videos. Contact Facebook for Mobile features like: Mobile, Deals and Places. You also contact Facebook for Instant personalization, Platform applications, Social plugins, Privacy and Safety. Checkout specific contact forms to submit feedback / suggestions to Facebook. You can attempt to reach Facebook by email using IDs: [help@facebook.com and info@facebook.com]. However, you need to keep trying as reply to every email contact is not guaranteed. Ideally, Facebook does not provide support on telephone. However, there is a Facebook phone number [+1 (650) 543-4800 – source ] for law enforcement, copyright claims, etc issues. Technical support in not provided on this phone number, for that you need to contact Facebook using contact forms in help section of Facebook website (as listed above). All support options are available at Facebook Help Center [facebook.com/help]. 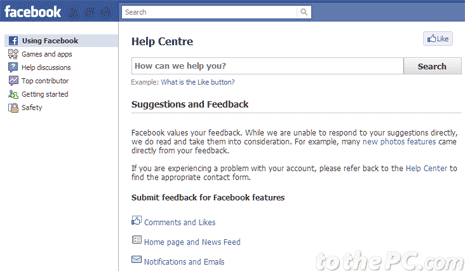 You can also access ‘Help Discussions’ section on left side of Facebook Help Center to interact with other Facebook users and discuss on issues at hand. Is facebook really shutting down this march 15? Please inform me via email as early as possible. i am waiting for your reply. but news.boisell.com claims that its false news.